With her resplendent marble floors, deep woods and rich fabrics, Queen Victoria epitomises elegance and charm. Sailing all over the world, her graceful splendour can be experienced on short cruises around Europe as well as longer voyages to the furthest reaches of the globe. "From the second she came into view as I approached the dock in Southampton and saw her towering over the terminal building, I knew it was going to be a special trip..."
As the second largest liner in Cunard’s fleet, many of Queen Victoria’s passengers enjoy her slightly smaller features in comparison to the larger Queen Mary II. Her special ambience, so adored by her passengers and crew, is evocative of great liners of the past, and yet her luxurious facilities are among the most modern you will find. With seven restaurants, thirteen bars, three swimming pools, a glamorous ball room and a magnificent theatre, she guarantees a premium voyage to all who sail with her. Queens Grill Suites provide your own personal haven in the most spacious and decadent accommodation. Complete with marble bathroom and whirlpool bath, guests can indulge in sumptuous luxury. Guests of the Princess Grill enjoy stunning suites and special flourishes, including personalised stationery, a Bon Voyage bottle of wine, fresh fruit and concierge service. Beautifully decorated with soft colours and fine art prints, Britannia Staterooms offer guests incredible comfort with Inside, Balcony and Ocean View options. Experience world-class cuisine and enjoy Cunard’s White Star Service, which sets the standard by which all others are judged. During the day, the splendid Queen’s Room is the venue for traditional White Gloved Afternoon Tea. Grills customers have exclusive access to Princess and Queens Grills restaurants with their intimate and sophisticated atmosphere as well as private Grills terraces and lounges. As the largest dining venue, the iconic Brittania restaurant creates a wonderful sense of occasion, with a magnificent sweeping staircase and Art Deco inspired design. Choose from a delightful selection of entrees, savour magnificent main dishes and indulge in delectable sweet treats. If you're a steak, lobster or king crab fan, be sure to make a visit to The Verandah restaurant for Steakhouse at The Verandah. Taking an influence from both sides of the Atlantic, Cunard's chefs have created a menu showcasing prime USDA grain finished New York strip steak, Maine lobster, Alaskan king crab and much more to whet your appetite. To view the dinner menu, please click here. You will also find a selection of crafted cocktails that reflect some of the world's most dynamic cities, including a Brooklyn Sour, Moonshine Martini and a Queen Affair. For the full cocktail menu, please click here. For smaller bites, the Cafe Carinthia offers light dishes at lunchtime and cakes and pastries at teatime, while the Golden Lion pub celebrates traditional English pub food with options including beer-battered fish and chips and satisfying ploughman’s sandwiches. At the end of December 2018, guests travelling on a voyage of four nights or more can upgrade to Cunard’s new inclusive drinks package, offering an extensive range of delicious beverages on board. Guests can choose from a range of packages to suit their drinking requirements, including a Soft Drinks option, Specialty Hot Drinks, Premium Soft Drinks, Beer, Wine and Spirits option or a Wine Collections option. Packages start from $10 per guest per day and are available to purchase from any bar and lounge on board. To see a breakdown of each package, please click here. At night, the Queens Room is the magnificent setting for Captain’s cocktail parties and elegant balls. Royal Night Themed Balls see guests dancing in their finest tuxedos and shimmering gowns to the sound of the talented resident orchestra. For a more contemporary experience, the stunning Hemispheres nightclub is the place to dance to the beat of the big band and the resident DJ under the splendid glass-domed ceiling. Live piano music, jazz bands and a string quartet create a wonderful atmosphere throughout many of the exceptional bars and lounges. Enjoy lavish music and dance productions performed by Cunard’s Royal Dancers and Singers at the spectacular Royal Court Theatre. With its regal red and gold seating, it also boasts the first private viewing boxes at sea for an unforgettable evening. The Monte-Carlo inspired Empire Casino offers plenty of chances to tempt Lady Luck with gaming tables, slot machines and video poker. Learn to play or brush up on your existing skills with complimentary gaming lessons. The Royal Spa comprises breath-taking ocean views, tranquil treatment rooms and indulgent therapies. Soothing massages, treatments for couples, and wellness and beauty seminars are just some of the ways to unwind and indulge during your voyage. Work out in the state-of-the-art Fitness Centre or join one of the many fitness classes, from relaxing Yoga and Pilates to energising aerobics classes. Young passengers enjoy activities throughout the day and into the evening. The Playzone caters for children between 1 - 7 years to enjoy arts and crafts, story time, puzzles and games, and is staffed by qualified early-years professionals. Supervised by Youth Staff, The Zone is an area designed for 8-12 year olds providing games and activities such as games consoles plus sport competitions, arts and crafts and scavenger hunts. The Teen Zone is a great hangout for 13-17 year olds, with pizza parties, discos, sports tournaments and fun activities throughout the day. The Night Nursery is perfect for little ones, 12 – 23 months and is supervised from 6pm-11pm so you can enjoy the array of evening entertainment. There are plenty of opportunities to keep active during your voyage. Passionate golfers can practise on deck with golf nets, while fans of tennis can take to the court for an energetic game. For the first time at sea, guests can learn and practice the art of fencing aboard the Queen Victoria. It’s also the perfect chance to master traditional nautical games, such as shuffle board and deck quoits. Play with friends or take part in an organised tournament. Major sporting events are covered by sports channel Sports24. Watch live in selected bars and lounges, and in all staterooms and suites. Enjoy a first-run feature during your voyage in the spectacular setting of the Royal Court Theatre. You'll also find a selection of movies throughout the day on the stateroom television. Explore a range of historical and contemporary issues with notable guest speakers. Featured speakers have previously included explorers, academics, former ambassadors and politicians, historians and scientists, novelists, biographers and award-winning actors and film makers. Join leading winemakers from around the world for fascinating complimentary lectures and to discover the exciting wine-themed events, including hosted tastings, due to happen on board. The Queen Victoria’s impressive library holds a collection of 6000 books for you to browse and enjoy. Join the Cunard Book Club, hosted by the resident librarian to discuss your thoughts and opinions with fellow passengers. As you enjoy extraordinary shopping in the Royal Arcade, lose yourself in the beautiful book and souvenir shop, and look out for voyages featuring book signings by renowned authors and lecturers on board. Approximately 152 sq. ft. A bottle of sparkling wine welcomes you to your Britannia Inside stateroom, which boasts a king-sized bed or you can request two single beds, satellite TV, sofa, tea and coffee making facilities, mini-bar, desk with stationery. Your bathroom has an invigorating shower, Penhaligon's toiletries and robes and slippers. Plus, enjoyCunard’s nightly turndown service, with a 'good night' chocolate on your pillow, ending each day in style. Your steward is always available for help, and to keep your stateroom in fine order, and you can order complimentary service 24 hours a day. Approximately 200-243 sq. ft. The most spacious of Cunard’s inside staterooms, a Deluxe Inside offers the same luxurious detail, from the welcome bottle of sparkling wine to the nightly turndown with a pillow chocolate. There’s a king-sized bed, sofa, satellite TV, tea and coffee making facilities, a mini-bar and a desk with stationery. The bathroom has an invigorating shower, Penhaligon's toiletries and robes and slippers. Your steward, always available for help and advice, will keep your stateroom in order, and a complimentary 24-hour room service menu is available. Approximately 159 sq. ft. A relaxing retreat, you'll find your accommodation perfectly appointed. Single Inside staterooms provide spacious accommodation including a bed with a generous width, bathroom with a shower and plenty of storage space in the wardrobe. Enjoy all the luxuries of the Britannia experience including 24-hour room service, fine Penhaligon's toiletries and nightly turndown service with chocolate. Approximately 197 sq. ft. Awaken with the gentle natural light from your window as you explore the world from these stylish staterooms. They feature a king-sized bed or you can request two single beds, a living area with desk and sofa, tea and coffee making facilities, satellite TV, ample storage and a mini-bar. The stylish bathroom has a shower, with bathrobes, slippers and Penhaligon's toiletries. Your steward will help keep your stateroom immaculate, while there’s also a nightly turndown and complimentary room service at any time of night or day. Approximately 180 sq. ft. 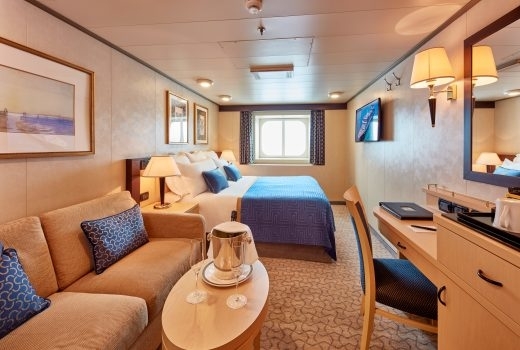 These stylish staterooms feature a king-sized bed, or you can request for two single beds, a living area with desk and sofa, tea and coffee making facilities, satellite TV, ample storage and a mini-bar. The stylish bathroom has a shower plus bathrobes, slippers and Penhaligon's toiletries. They offer natural light from their window, although the view is slightly obscured due to its position on the ship. Your steward will help keep your stateroom immaculate, while there’s also a nightly turndown and complimentary room service at any time of night or day. Approximately 133 sq. ft. Natural daylight and magical views of the sea can be enjoyed from your Single Oceanview stateroom. Relax in classic comfort with sumptuous cotton sheets and soft bathrobes. Enjoy all the luxuries of the Britannia experience including 24-hour room service, fine Penhaligon's toiletries and nightly turndown service with chocolate. Single Oceanview staterooms include a bed with a generous width, bathroom with a shower and plenty of storage space in the wardrobe. Approximately 228 sq. ft. These stylish staterooms feature a king-sized bed or two single beds on request, a bathroom with a shower, as well as Penhaligon's toiletries, bathrobes and slippers. There’s a living area with a desk, satellite TV, tea and coffee-making facilities, a mini bar and a private balcony, which has a slightly obstructed view due to its position on the ship. Your steward will help everything stay in order, there’s a nightly turndown service, complete with a pillow chocolate, and you also benefit from complimentary 24-hour room service. Approximately 228-472 sq. ft. Your stateroom is bathed in natural light and benefits from ample storage. There’s a turndown service, complete with a pillow chocolate, ready for a comfortable night’s sleep in your king-sized bed or you can request two single beds. Your bathroom features a shower, enhanced by Penhaligon's toiletries, a bathrobe and slippers. There’s a living area with a desk, satellite TV, tea and coffee-making facilities and a mini bar. Regular visits from your steward ensure everything stays pristine, and there’s also round-the-clock complimentary room service. Approximately 228 sq. ft. Luxury awaits from the moment you arrive in your Club Balcony stateroom to find a chilled bottle of sparkling wine. It features all the hallmarks of Cunard style and comfort, from the king-sized bed (or two singles on request), 24-hour room service, luxurious bathroom with shower, bathrobe and slippers, nightly turndown service with chocolate, lounge area and satellite TV. You’ll benefit too from a nine-pillow concierge menu, a private balcony, and the choice to dine when you wish in the intimate, single-seating Britannia Club restaurant. Approximately 1,319 sq. ft. The most lavish suites on Queen Victoria have a sleeping area with a king-sized bed and pillow concierge menu, twin marble bathrooms with Penhaligon's toiletries and dressing rooms. There’s room to entertain, including the expansive private deck. You’ll also have an interactive TV, iPad, illy coffee machine and complimentary mini bar and desk with personalised stationery. You can dine in-suite from the Queens Grill restaurant menu, and enjoy a butler and concierge service, and access to The Courtyard, Grills Lounge and Terrace, priority embarkation, disembarkation and tender services. Approximately 1,100 sq. ft. These exquisite suites on feature a king-sized bed and pillow concierge menu, marble bathroom with Penhaligon's toiletries and dressing areas. There’s an expansive private deck, interactive TV, iPad, illy coffee machine, complimentary mini bar and a desk with personalised stationery. You can savour pre-dinner canapés, or even dine in-suite from the Queens Grill restaurant menu. You’ll also benefit from an inclusive butler and concierge service, exclusive access to the Grills Lounge and Terrace, priority embarkation, disembarkation and tender services. Approximately 335 sq. ft. These lavish suites offer a spacious private balcony, bathroom with a bath and shower, a king-sized bed or two singles on request, dressing room, living area with a sofa and desk, illy coffee machine, atlas and satellite TV. Luxurious extras include personalised stationery, velour robes and slippers, Penhaligon's toiletries, a complimentary bottle of wine, a nine-pillow concierge menu, fresh fruit and a nightly turndown service. You’ll have exclusive access to the Grills Lounge and Grills Terrace too, while Cunard’s Grills Concierge can make any arrangements on your behalf. Approximately 484 sq. ft. These suites with a private balcony occupy an enviable Midships position. They have a king-sized bed and pillow concierge menu, a dressing area and a bathroom with bath, shower and Penhaligon's toiletries. Amenities include a TV, iPad, illy coffee machine, complimentary mini bar and a desk with personalised stationery. Canapés will arrive before dinner, you can dine in-suite from the Queens Grill restaurant menu and the butler and concierge services ensure you feel at home. You’ll also enjoy access to the Grills Lounge and Terrace, and priority embarkation, disembarkation and tender services. Approximately 335 sq. ft. These superbly appointed suites include a king-sized bed, pillow concierge menu, dressing area, luxurious bathroom with bath and shower, Penhaligon's toiletries, robes and slippers. Satellite TV, a fully-stocked bar, illy coffee machine, fresh fruit, books and a desk with personalised stationary await too. Relax in your lounge area, enjoy pre-dinner canapés and even dine in your suite from the Queens Grill restaurant menu. Your butler and concierge will see to your every request, while priority embarkation, disembarkation and Grills Lounge and Grills Terrace access all enhance the experience.